On forty-fourth birthday, I hiked into a volcano. This happened during an early-April bucket list trip with my husband to the Big Island of Hawaii. A recovering adrenaline junkie with a deep love of adventures, I’d dreamed of standing next to a lava river or perhaps watching a lava fountain rise in the air for years (from a safe distance, of course). 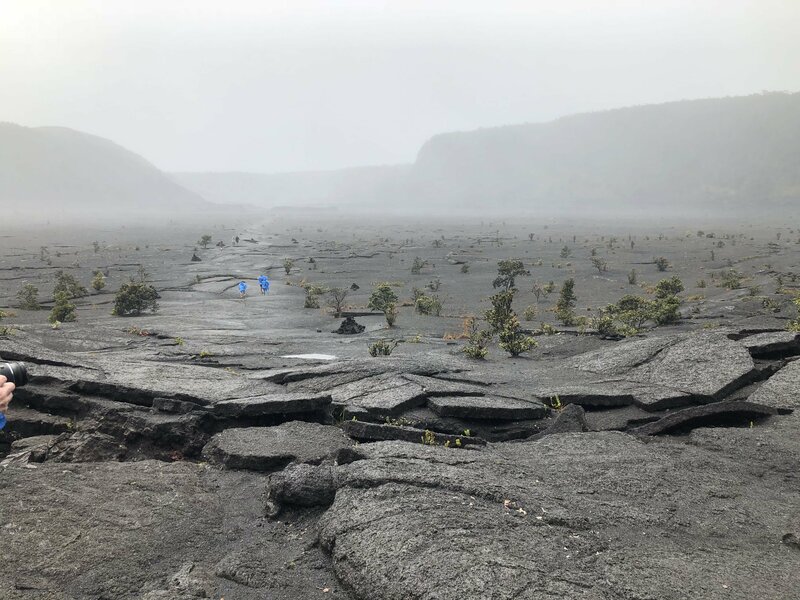 Since it was my birthday, I felt certain this would happen.The Hawaii Volcanoes National Park includes a series of craters–some erupted in the past while others, like the Halema‘uma‘u Crater, are still active. Our first stop was the Jaggers Museum observation deck. The lava lake in the Halema‘uma‘u Crater was high, and despite the miles between me and the crater, I could see faint lava bubbles pop in the air. Volcanic heat pressed against my skin. (Birthday luck, check one). 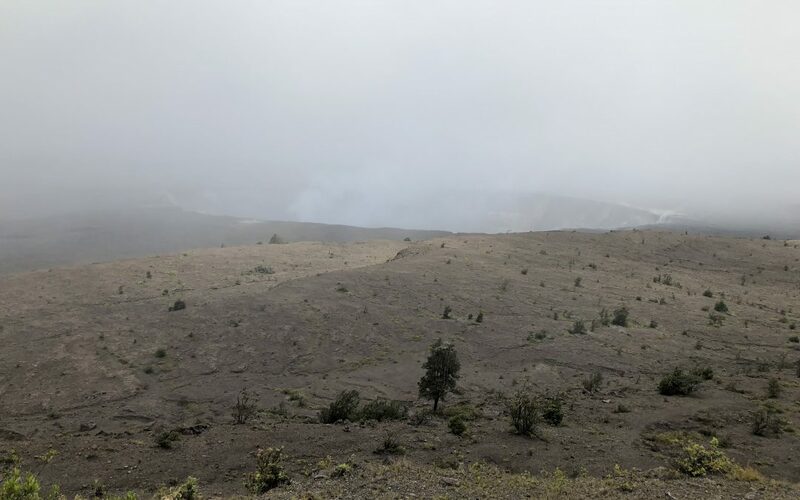 When we left the observation deck, we drove a few miles along Crater Rim Drive then hiked through a lush rainforest and into the Kīlauea Iki Crater lava lake. Cars lined the trailhead parking lot giving the air of calculated risk. 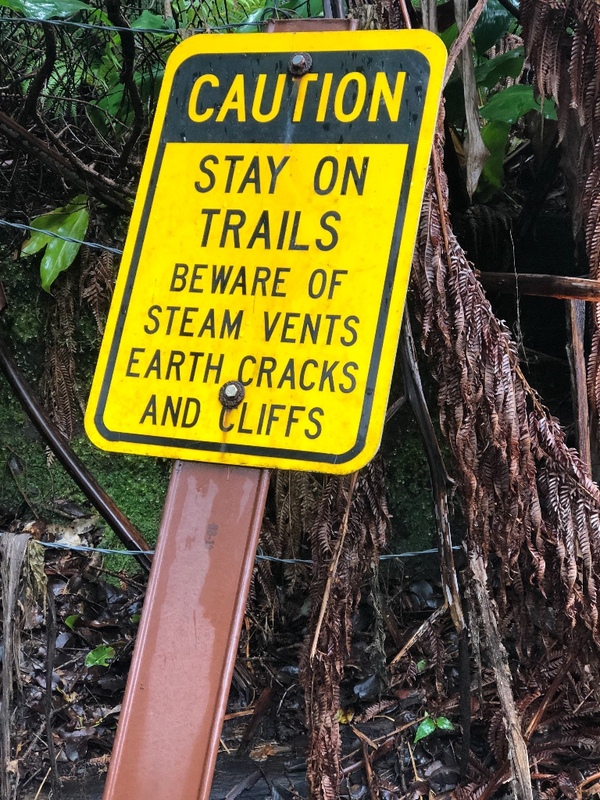 We laughed at the signs warning of instability and steam vents. Inside the crater’s Martian landscape things got real. The largely barren, brownie-batter-like floor was surrounded by high cliff walls. Steam plumed from broken rocks resembling frozen waves. Signs warned us not to veer from the rock-pile-marked trail. Lava could bubble up, after all. If something happened, escape would be difficult. A mile in, rain battered me. Instead of turning back, I knelt on the lava floor and felt the pulsing volcanic heat—another reminder that while the surface may hold me, a magma river flowed beneath my feet. I was in adventure heaven. 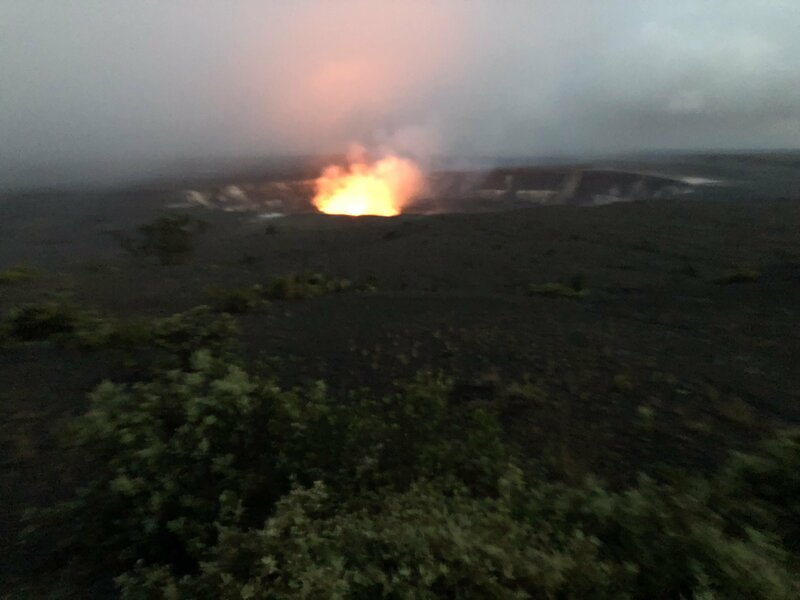 When we returned to the Halema‘uma‘u Crater at sunset to view the lava lake’s nightly show, the vibrant lava and ash against the twilight and the thrill of being so close to such a magnificent force made me forget my sore feet and soaked clothes. While my spurting lava wishes weren’t granted, the experience met all my birthday criteria. Thank you, Mt. Kilauea. We left Hawaii on April 14, 2018. Over the next two weeks, Mt. Kilauea rumbled. Lava continued to rise. On May 3, 2018, the Pu’u O’o crater collapsed. Pressure built underneath the surface. Spontaneous eruptions broke apart subdivision roads, sending lava fountains hundreds of feet high. That spectacular show I’d witnessed only a few weeks earlier was not the gentle entertainment of a cat-napping giant. It was the precursor to a major eruption. Like all things, this reminded me of the writing process. As writers, we come to the page ready to entertain and enlighten. But once there, we need to figure out how to approach our stories. Should we stand on the observation deck or hike into the crater? Many writers start their drafts on the observation deck—viewing the story from afar. They tell what happened. I went on an exciting trip to Hawaii. We hiked in into a crater then viewed the lava lake at night. It was awesome. There’s nothing wrong with starting here if that motivates you to write, but the excitement happens while you stand inside the volcano, not while you’re looking at one. Readers want to feel your fear, anger, and excitement. They want to smell the steam and feel the rock. To do this, your work must come alive. In writing, the walk into the crater is often called writing in scene. Richard Roorbach, author of Writing Life Stories defines scenes as “events that take place in a specific time and place. Scenes record events, actions, talk, stuff happening.” It’s the cinematic version of the lived experience. Or, to put it simply, it’s showing rather than telling. Whether you’re writing a memoir or a short story, showing is essential. But how do you know if you’re doing this? Set a timer for twenty minutes, write without stopping, and see what happens. After you’re done, ask whether the work reads like you’re reliving the experience or like you’re telling it from your armchair. If you’re reliving events, you’re hiking the crater. Keep this up. If the work feels observational, see if you can choose a specific memory to fully render. Fill it with sights, smells, and sounds. Add some dialogue. If this feels like a challenge, get curious about why you’re standing on the observation deck. Are you having trouble remembering exactly what happened? Is the topic so emotionally charged it feels painful? Are you unsure where to begin? If memory is the problem, look through a photo album and find a picture that evokes strong feelings (for fiction choose a magazine photo). Show what happened directly before the photo was snapped. Where are the characters? Who is there? Why are they taking this picture? Repeat this exercise until you get a sense of who your narrator is and what she’s after. Once you’ve exhausted your pictures, create a physical map of your story’s setting, as Richard Roorbach suggests in his book. You can also listen to music from the era you’re writing about to evoke new memories, but don’t forget the power of smell and taste. Follow Marcel Proust’s lead and eat something from the period you want to capture. As you taste that familiar dish, recreate the scene where you ate it. Who was there? What was going on? How did it feel in your mouth? The more you write, the more you’ll remember. If, as you’re writing, the work brings up painful feelings or the events you want to write about include trauma, break the experience into smaller parts. Be sure to list the pleasant scenes as well as the dark ones. Include dark humor and events where the narrator received help from others. Choose the least painful scene as your starting point. Write for twenty minutes and see how you feel. In a couple of days, repeat the exercise. If it’s still difficult, write from the observation deck until you develop comfort with the subject. If that doesn’t work, write about something else. If you’re not sure where to start, follow Kurt Vonnegut’s advice and make your character thirsty. Let his first search be for a glass of water. In an interview for Writing Hard Stories by Melanie Brooks (a must-read for any memoirist), Andrew Dubus says, “just because we know what happened doesn’t mean we know what the hell happened.” I would argue that until we create vivid scenes for our stories, what happened isn’t even clear. That’s why hiking the crater is so important. Mastering the scene in your early drafts will illuminate what happened. Along the way, you’ll begin to realize what the hell happened. Sprinkle it in, but remain open to new interpretations. More insightful reflections may arise as you read your complete draft or learn more about the situation. You never know. Life may happen, just as it did at the Hawaii Volcano National Park, giving you a new perspective. Your trips into the crater may begin as a spectacular birthday adventure only to turn into a cautionary tale on luck.